Accountable Care Units (ACU) are jointly-managed and geographically-distinct patient care areas that are responsible for the clinical, service and cost outcomes they produce. Emory's Nell Hodgson Woodruff School of Nursing, in collaboration with Emory Healthcare, has developed a series of Accountable Care Unit instructional videos to serve as a model for strengthening the collaborative practice environment across acute care, inpatient units. Accountable Care Units (ACU) are jointly-managed and geographically-distinct patient care areas that are responsible for the clinical, service and cost outcomes they produce. ACUs have four essential components, which include unit-based teams, patient-centered workflow, unit level performance data, and partnered unit management and accountability. Emory Healthcare’s Care Transformation Model: The Accountable Care Unit – an exploration of how the ACU operationalizes Emory Healthcare’s Care Transformation Model. T.E.A.M Safety Huddle: A twice-daily structured patient-centered process that addresses the safety concerns of the ACU. Bedside Shift Report:- A standardized structure that demonstrates a safe and efficient nursing hand-off process that actively engages the patient and family. 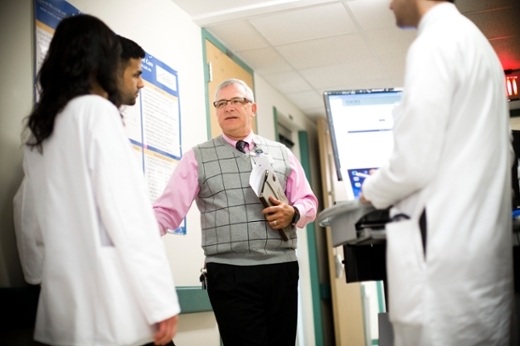 Structured Interdisciplinary Bedside Rounds: A process that takes the entire care team to the patient’s bedside on a daily basis and actively engages the patient and family in formulating the care plan for the day. "Emory has a long history of focusing on quality and continuously improving care," explains Linda McCauley, PhD, RN, dean of the Nell Hodgson Woodruff School of Nursing. "Our future nursing leaders now have an opportunity to learn how engaging patients and families, staff, providers, building on what we have learned from different reports and research findings, and experiences, all help to create this high-functioning team, all performing in our roles at a high level." In 2013, Emory received a three-year, $1.5 million award to further refine and spread the Accountable Care Unit (ACU) model across Emory Healthcare. This cooperative award was made by the Health Resources and Services Administration (HRSA) of the U.S. Department of Health and Human Services, through the Nurse Recruitment, Practice, Quality, and Retention-Interdisciplinary Collaborative Practice mechanism. The key objective is to increase the number of staff nurses trained to lead interdisciplinary, unit-based teams. The instructional videos are part of that initiative. The original concept was crafted by Jason Stein, then refined and operationalized by Stein and Bryan Castle, BSN, RN, who worked together as the pilot unit's leadership team. After nine months, and multiple rapid-cycle changes, they achieved a functional model that reflected the patient-centered, interprofessional, collaborative practice elements of Emory Healthcare's Care Transformation Model (CTM). The School of Nursing's Susan Shapiro, PhD, RN, helped secure funding to expand the ACU model across seven additional units and engage in a robust evaluation of the effects if the ACU on clinical and service outcomes. "We are pleased with the success of this collaboration," says McCauley. "This partnership expands the patient impact of ACUs within Emory Healthcare, and provides an enriched learning environment for our students. It also serves as a best practices model for interprofessional education for all academic institutions preparing health sciences students for the workforce."